After their oh-no-they-didn’t first-round upset of Missouri, the Norfolk State Spartans became the darlings of the NCAA tournament, one of two 15-seeds to oust a 2-seed in the Big Dance on Friday. (Lehigh also beat Duke that night.) It was heartbreaking to see them fall to the Florida Gators on Sunday, but it was particularly rough for me, and for other alums of historically black colleges. No shade to Lehigh folks, but I never heard of the Mountain Hawks before they toppled Duke on Friday. And I’m sure Lehigh is a fine program and all, but the Spartans were a particular kind of Cinderella. Think less well-known, 1950s Disney production and more like the 1997 made-for-TV version. All-black starting fives are not a revolutionary concept in the NCAA tournament. But starting fives from all-black colleges advancing past the first round of March Madness? That’s still a real feat. Only six 15-seeds have made it to the second round of the tourney, and three of those six come from the Mid-Eastern Athletic Conference, a group of historically black colleges or universities located along the Southeastern seaboard. This may sound cliché, but as Kyle O’Quinn put up 26 points and 14 rebounds against the Tigers, I was a Spartan. So was every HBCU alum watching that day. I went to Howard, a historically black university and MEAC school in Washington, D.C., so I know firsthand how HBCU students feel about their sports programs. The thing is, HBCU institutions don’t really have rivalries. Those are for schools that take athletics seriously. Unless they play for a team, students at HBCUs treat sports like a casual relationship — with appreciation, but not love. HBCU students really only care about two activities, neither of which are recognized as actual sports: marching band and fraternity/sorority stepping. At HBCUs, rivalries are based on which school has the best homecoming, or which school has the higher ranking in U.S. News & World Report. Still, for all the side-eyeing we give to our student-athletes, our school pride runs deep. We want our guys to do well, it’s just that they usually don’t, so we deal with the pain by cracking jokes. But every year, a small percentage of us pick our David over the opposing Goliath. 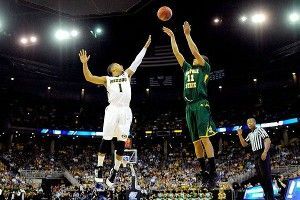 I chose Norfolk State to beat Missouri this year, not because I followed them all season. I didn’t dig up a single YouTube clip of this team, let alone watch a whole game. But ever since Hampton (another MEAC school, and technically a Howard rival) topped the 2-seed Iowa State in 2001, I have picked a MEAC team in the tournament. Unfortunately, Florida handed me and every other HBCU student and alum a drumming we’re used to receiving. No, the 84-50 beat-down the Gators gave wasn’t as bad as Kentucky’s beat-down of Morehouse College earlier this year, but it still hurt knowing there are now no more historically black colleges to cheer for in the tournament. And how could you not want that? Jozen Cummings is a writer living in New York City who always roots for an HBCU team but never bets on one. You can follow him on Twitter at @jozenc.